The Email Accounts tab in your 'Account & Settings' tab allows you to edit your primary email address, or add an alternate email address. 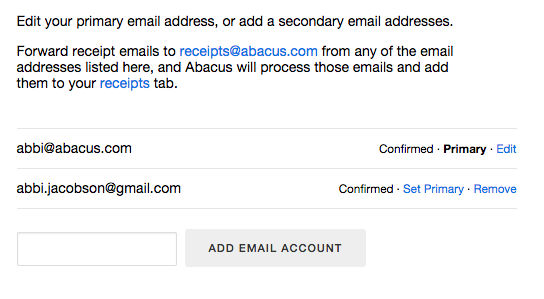 Adding additional email addresses to your account allows you to forward emailed receipts to receipts@abacus.com from those accounts, and Abacus will capture the images in those emails and add them to your receipts tab. These receipt images will then be accessible to you as you're submitting a new expense. You have the option to edit your primary email address ("Edit"), or set one of your alternate emails as your primary email address ("Set Primary"). Your primary email address is the address you'll use to sign into your Abacus account, but all emails in this list can be used with the forwarding receipts feature.